The new technologies of the 19th century dramatically changed people’s everyday lives. The development of machinery made domestic chores such as sewing, cleaning and washing faster and easier. 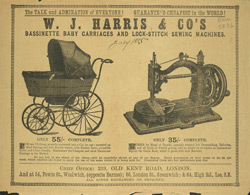 WJ Harris, the manufacturer featured on this leaflet, here advertises his Bassinette baby carriages and lock-stitch sewing machines. The sewing machine was one of the most popular labour-saving devices of the 19th century, both alleviating the labour of hand-stitching and making the mass production of clothing possible.